Highland Creek Farm is a newly renovated century farmhouse, ideal for a family or two. The farmhouse is beautifully and privately situated on 100 acres consisting of open fields, surrounded by 13 acres of hardwood maple forest, and 20 acres of cedar forest, with a small creek running across the property. The property enjoys wonderful vistas of the surrounding countryside. 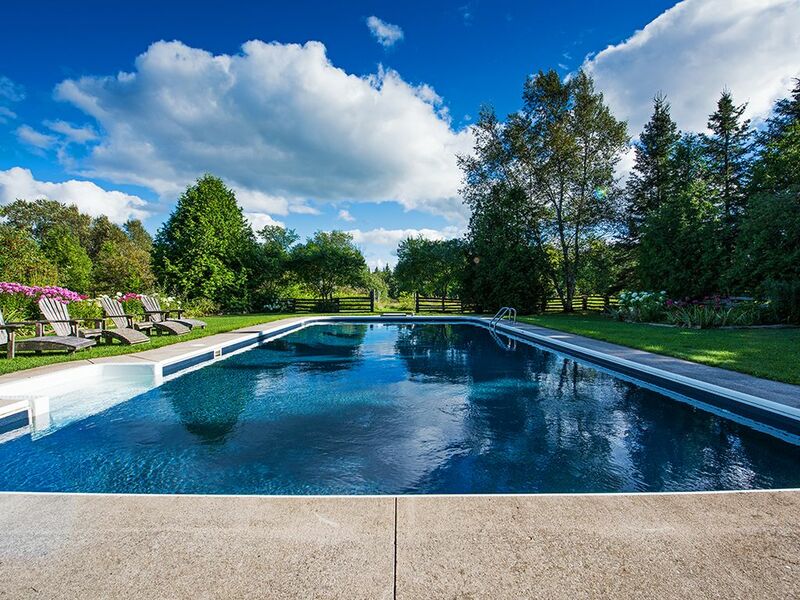 Highland Creek Farm is perfect for family getaways, swimming in the large saltwater pool, a weekend of golf with the guys/girls, a base for mountain or road biking, or just as a unique setting for pleasure or business. Start your day with breakfast in the sun room overlooking the pool. Lounge by the pool all day, have a hot tub and then enjoy lunch in the large screened summer porch. If you are feeling energetic, hike the trails through the hardwood maple forest or follow the stream through the cedar woods, looking for the speckled trout and nesting great blue heron. Watch for deer that come down to drink from the stream. Play badminton, shoot baskets or play ping pong with your guests, regardless of weather, in the huge restored post and beam barn. Maybe go for a mountain or road bike around the country side. Keep an eye out for local Mennonite families in their horse drawn carriages. As the sun sets, relax and enjoy dinners in the large dining room with it's pine harvest table that seats 14 guests. Maybe one of your guests can play the piano, while the rest of you enjoy a fire in either of two living rooms. If you want, it's only 20 minutes to downtown Collingwood, or 30 minutes to Wasaga Beach, but you won't want to leave the farm. A professional couple with two children in university. We grew up skiing in winters in the area, but discovered it's fantastic in spring, summer and fall too. Hiking, road biking, riding, fishing, golf or whatever activities you are into. This farm itself has it all - trails in the woods for hiking, fields for views, a freshwater stream, a fully restored historic farmhouse that pre-dates Canada's confederation. And a giant barn for ping pong, badminton, basketball, working out, or just hanging out. With trails on 100 acres through the woods and along the fencerows between the fields, you can hike, mountain bike, cross country ski or snowshoe without ever leaving the property. In summer we love to eat all our meals on the screened porch overlooking the pool, or relax by the pool with a cold drink. In winter we have lots of guests for dinner in the large farmhouse dining room and relax after in front of the fire with a mug of coffee. toilet, shower, Marble counter top, nickel plated fixtures, walk-in shower. toilet, combination tub/shower, Antique vanity, nickel plated fixtures, cast iron tub. outdoor shower, Poolside outdoor shower with hot and cold running water. 30 minutes to Blue Mountain Resort. 15 minutes to Devils Glen Country Club. On 100 private acres, with hiking trails through fields along the year round creek and through both maple and cedar forests. Back deck faces south over pool to freshwater creek. Year round freshwater creek runs for half a kilometer through the 100 acre property. Comfortable geothermal cooling/heating. Environmentally friendly. Comfortable geothermal heating is environmentally friendly and provides steady comfort year round. Bring your own towels for the pool. High end Miele brand silent dishwasher, makes cleanup possible while talking and cooking. 4 slice toaster good for families. Plates and cutlery for up to 18 people. Antique brass chandelier and sconces. Upright piano to entertain your friends. Bay window over looking pool and gardens. Satellite TV plus Smart TV. Smart TV - play music from your iphone or ipad. Plenty of board games, Sorry, checkers, dominoes, crokinole, etc. Perennial gardens by pool. Huge lawn facing sunset, good for soccer, horseshoes, or whatever. Close to Devils Glen and Beaver Valley. Blue Mountain is only 30 minutes away. Many nearby courses. Duntroon Highlands, Batteaux Creek, all the Collingwood area courses. There is a bedroom and two bathrooms on the first floor. Saltwater for softness on skin. Large restored 1861 post and beam barn with indoor basketball, ping pong and badminton. Minutes from beautiful hiking on the Bruce Trail, mountain biking at Three Stages and Kolapore Wilderness Area, miles of road bike lanes weaving up and down the scenic Blue Mountains and Beaver Valley area, 25 minutes to Blue Mountain village, 30 minutes to the worlds largest fresh water beach at Wasaga, access to several golf clubs, Scenic Caves, picnic on the shores of Georgian Bay.... or relax by your own private stream on the property. Another great stay, George. Best, Brian. A charming farm house with lots of character. The surrounding grounds allowed for hours of exploration, and the barn was great fun for the kids. With a 35 minute drive we were able to utilize the ski hills in Collingwood while enjoying privacy and peacefulness back at the farmhouse. George was very helpful and responsive to our requests and inquiries. Wonderful place for a quiet getaway with family and friends. Rustic setting with all the amenities. Easy drive to quaint cafes, restaurants and ski hills. Snow only enhances the warm welcome offered by this beautiful space and gracious hosts. It’s a great spot for an intergenerational family gathering, with something for everyone - games in the barn, hikes in the woods, cozy fireplaces and good books. Thank you! We’ll be back. We had the most incredible stay! Everything was perfect, especially for families! We had the best time staying at this farm. It is especially great for families, as there was so much to do! We swam in the pool and hot tub everyday, went for nature walks, played in a playground, and enjoyed The renovated barn which had a basketball court, ping pong, and more games. We enjoyed roasting marshmallows over the outside fire pit and fires inside the farm. I could not recommend this property more!!!! We can’t wait to go back! Glad you enjoyed our farm! The place has a rustic charm. It's big, comfortable, well equipped and very hospitable. I was perfect for us.